Rooftop botany goes to ground - my plant nursery: Your Name's Not Down, You're Not Coming In! Crikey, in a week when I have been resting my broken foot I have taken an awful lot of deliveries! Regular readers will know a big box of loveliness came from Kevock Garden Plants (see posts passim) and yesterday my huge (I hope) Lilies arrived to complete my order from J.Parker. They look good but my only moan is they sent me 5 "White Triumphator" when I ordered pink but I'm not going to make a fuss about that. So, they've gone in to a large but squattish clay pot. I don't thing they will need more than the 8in depth altogether, above and below, slightly more room above than below.Bulbs have an amazing capability for finding their own level by using their roots to push or pull the bulb into its optimum level. They will, however, need supporting if they turn out to be the monsters (1.5m) advertised. Also planted into containers that look like shiny metal wastepaper bins but which are in fact plastic, which came as a surprise when I tried to punch drainage holes in the bottom and instead of little circles I got great shards of plastic coming away. Fortunately nothing a bit of crock couldn't cover, so lancifolium "Flore Pleno", a strange looker but that's why I'm in this game. Give me a tray of bedding Begonias and six months later I'll show you a small compost heap. 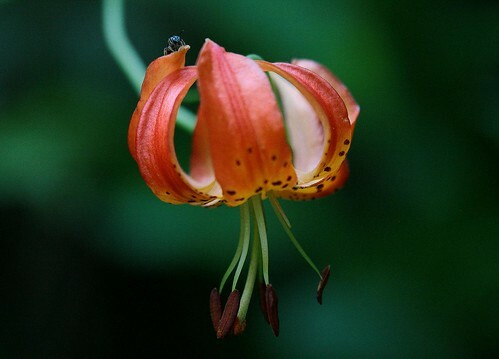 The third Lily is "Robert Swanson", a yellow with beautiful red throats. I also planted the Iris laevigata "Colchesterensis" seeds that have been soaking for 36 hours to break down their rock-hard coating. You can also do this by "chitting" which invloves a sharp knife, a seed and a very steady hand, so I tend not to do this as despite (or perhaps because!) I'm tee-total, I have rather unsteady hands and even experts (or vaguely knowledgable amateurs?) can damage the embryo. It just takes a very light slit, just enough to let water in, and only to the seed casing, DON'T TOUCH THE LIGHY GREEN BIT INSIDE! THAT'S THE PLANT! Best to soak 'em, it works for all hard coated seed I've grown, from Lathyrus to Iris. And then there was a delivery from the excellent Buckland Plants (no Keith, I'm not on commission from them either). Fortunately everything was already potted up and needed nothing more than unwrapping and one Iris, kerneriania potting on as I actually had do cut the pot open to get at it and have never seen so many roots! They always say in this situation one should tease the congested roots out but I had to do a bit of tearing and ripping. I did thing about splitting it but in the end I just gave it a considerably bigger pot and gritty, peaty compost. It will be fine. 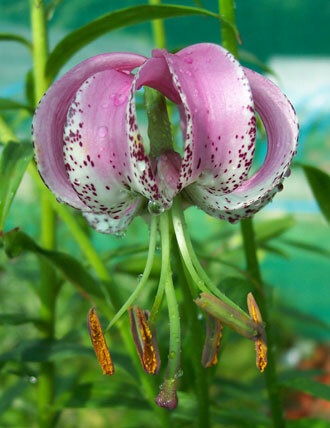 More Lilies but of a more delicate type: Liliums langkongense, medioloides, pardalinum ssp. vollmeri and auratum, which actually came from Kevock but I forgot to mention it the other day. Otherwise I finally got my hands on a Nomocharis mairei (ex cld 1490) - the bits in brackets are code for the expedition where the original seed was collected. When I was in Tibet 10 years ago they had only just made GPS affordable which made height so much easier to record. In fact I don't know how they did it before: you can hardly use trigonometry when there is almost nothing on the horizon and you have only a rough idea where the sea is. Dad, you might want to comment at the end, I'm sure you'll know. For some reason Nomocharis have been in really short supply this year, Glendoick had none big enough and several other sources said the same. The rest of the bunch are a, well, mixed bunch in that they don't have long stems with pretty flowers at the top. Apart from Frtillaria affinis, which I've accidentally got two of but I'm not complaining! Iris "Green Spot". Only a few inches tall but a bit of fun. Not my usual style but the nursery had run out of Hellebores so I took this instead. I also have a red postcard from the post office, despite two people being in when the mail was delivered, which is probably from Paul Christian, and I've got a load of seeds from Chilterns to sow: Digitalis nervosa, D. Lanata, D. Stewartii, D. viridiflora, Clematis LadakhianaPenstemon digitalis, Iris graminea (in case any harm should come to the plant I have), Cyclamen pseudibercum, Dianthus arenarius nanus, Impatiens balsamina. OH. MY. Gawds! I have serious plant envy now. So many in this post I've never seen before, but I think Iris 'Green Spot' may be my favourite. Love the petite irises, grow some spring varieties like I. reticulata and I. danfordiae (sometimes var. danfordiae, I'm finding) because they're like petitepoint coming out of the snow. You're going to have such fun with all these delights. (AKA theplantboy) Hi Jodi, funnily enough it was the miniature bearded irises that got me into the genus when I was a about 12. I built up a collection of about 100 species before moving to London and not having a garden, so I'm very restricted in what I can grow on my roof. Check out Iris lacustris and the dwarf form of setosa for starters but I warn you, it's addictive!